We're reaching levels of liberal lunacy never before thought possible! On the 17th anniversary of the most devastating attack on the U.S. in the 21st century, a cartoonist is facing backlash for his politicization of tragedy. 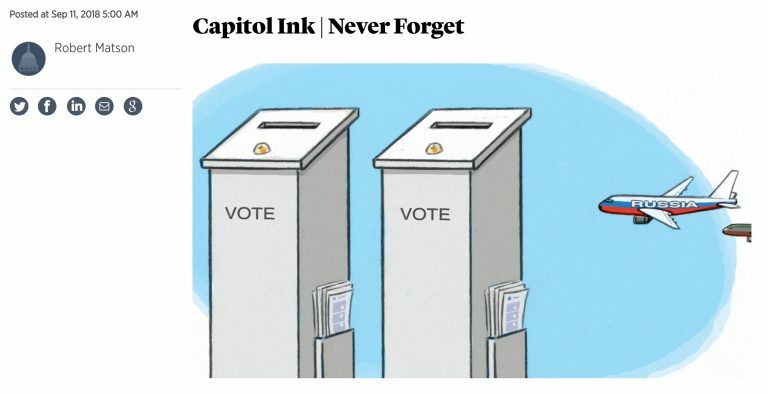 Tuesday morning, Roll Call's Capitol Ink featured an illustration titled "Never Forget." While that phrase may evoke somber remembrances of Sept. 11th, 2001, the artist, Robert Matson, turned it into a commentary on election meddling instead. Shown in his drawing is a Russian plane headed toward two grey towers meant to represent ballot boxes. The implication is clear: Russia is a treat [sic] to the security of U.S. elections. I can't even fathom the levels of idiocy required to create something so stupid. The "Never Forget" title, comparing 9/11 to a few million allegedly spent on Facebook ads and sh**ty memes... I literally can't even!